Below you will find the description of these properties from 100 years ago. To create a snapshot of the village in 2013, please submit information about your property's current occupiers using the form at the bottom of the page. This terrace replaced an earlier terrace of houses which, according to early 19th century maps, was set further back from the road. This terrace was still extant on the OS First Edition of the 1860’s but had been replaced by 1900. 327 – 1 Red Terrace. Occupier Thos Graham. Owner Jas Thomson for Sir W Lawson. Parlour, kitchen, 2 bedrooms, back door only. (water put on since 1909 also garden added to rental since 1909) use of 2 earth closets. Yard. 6 coalhouses & washhouse to 6 tenants. Stone built slated fairly good. Let in 1909 @ 2/6 per week clear. Freehold. 328 – 2 Red Terrace. Occupier Ruth? Lawson. Owner Jas Thomson for Sir W Lawson. Parlour, kitchen, 2 bedrooms, back door only. (water put on since 1909 also garden added to rental since 1909) use of 2 earth closets. Yard. 6 coalhouses & washhouse to 6 tenants. Stone built slated fairly good. Let in 1909 @ 2/6 per week clear. Freehold. 329 – 3 Red Terrace. Occupier Walter Mitchell. Owner Jas Thomson for Sir W Lawson. Parlour, kitchen, 2 bedrooms, back door only. (water put on since 1909 also garden added to rental since 1909) use of 2 earth closets. Yard. 6 coalhouses & washhouse to 6 tenants. Stone built slated fairly good. Let in 1909 @ 2/6 per week clear. Freehold. 330 – 4 Red Terrace. Occupier Jos Thompson. Owner Jas Thomson for Sir W Lawson. Parlour, kitchen, 2 bedrooms, back door only. (water put on since 1909 also garden added to rental since 1909) use of 2 earth closets. Yard. 6 coalhouses & washhouse to 6 tenants. Stone built slated fairly good. Let in 1909 @ 2/6 per week clear. Freehold. 331 – 5 Red Terrace. Occupier Sam Lawson. Owner Jas Thomson for Sir W Lawson. Parlour, kitchen, 2 bedrooms, back door only. (water put on since 1909 also garden added to rental since 1909) use of 2 earth closets. Yard. 6 coalhouses & washhouse to 6 tenants. Stone built slated fairly good. Let in 1909 @ 2/6 per week clear. Freehold. 332 – 6 Red Terrace. Occupier Chris Harker. Owner Jas Thomson for Sir W Lawson. Parlour, kitchen, 2 bedrooms, back door only. (water put on since 1909 also garden added to rental since 1909) use of 2 earth closets. Yard. 6 coalhouses & washhouse to 6 tenants. Stone built slated fairly good. Let in 1909 @ 2/6 per week clear. Freehold. 308 – Blennerhasset. Field & barn. Occupier J Dickinson. Owner Jas Thomson, Land Agent for Sir W Lawson. Stone built & slated barn contains byre for 3 cattle & loosebox lofted. Poor repair. Rent £11. Freehold. Red Gable, modern building replaced the Field Barn. 309 – Saw Mill. Occupier T.T.Robinson, Owner Jas Thomson. Joiners shop and saw mills, etc. contains:- Large joiners shop cellared under whole. Paint shop. Mill wheel & first(?) drive machinery. all other structures belong to tenant. Stone built slated only fair. Let @ £13/10/- pa. & rates. The Old Saw Mill. Converted to residential post 1913. 317 – Blennerhasset. 1 West Terrace. House. Occupier J Dickinson. Owner Jas Thomson for Sir W Lawson. Kitchen, large bk kitchen, 2 large bedrooms, yard &C as Ref. No. 322. only one door out (back to back house). Stone built slated fair. Let @ 2/5 per week clear. Freehold. 318 – Blennerhasset. 2 West Terrace. House. Occupier J Walker. Owner Jas Thomson for Sir W Lawson. Kitchen, 1 bedroom, has back door only. Stone built slated stuccoed fair. Let @ 1/6 per week clear. Freehold. 319 – Blennerhasset. 3 West Terrace. House. Occupier Isa. Ostle. Owner Jas Thomson for Sir W Lawson. Parlour, kitchen, 2 bedrooms, no back door. Tap has recently been erected in house. Yard 6 coal Houses, 5 earth closets & 2 washhouses to 6 tenants. Stone built slated stuccoed fair. Let @ 2/3 per week clear. (Particulars & valuation as Ref No 322 ‘rather a larger house, same rental.) Freehold. 320 – Blennerhasset. 4 West Terrace. House. Occupier Jos Thompson? Thompson. Owner Jas Thomson for Sir W Lawson. Parlour, kitchen, 2 bedrooms. No back door. Tap has recently been erected in house. Yard 6 coal Houses, 5 earth closets & 2 washhouses to 6 tenants. Stone built slated stuccoed fair. Let @ 2/3 per week clear. Freehold. 321 – Blennerhasset. 5 West Terrace. House. Occupier Ann? Harris. Owner Jas Thomson for Sir W Lawson. Parlour, kitchen, 2 bedrooms. No back door. Tap has recently been erected in house. Yard 6 coal houses, 5 earth closets & 2 washhouses to 6 tenants. Stone built slated stuccoed fair. Let @ 2/3 per week clear. Freehold. 322 – Blennerhasset. 6 West Terrace. House. Occupier Mrs? Steele. Owner Jas Thomson for Sir W Lawson. Parlour, kitchen, 2 bedrooms. No back door. Tap has recently been erected in house. Yard 6 coal houses, 5 earth closets & 2 washhouses to 6 tenants. Stone built slated stuccoed fair. Let @ 2/3 per week clear. Freehold. 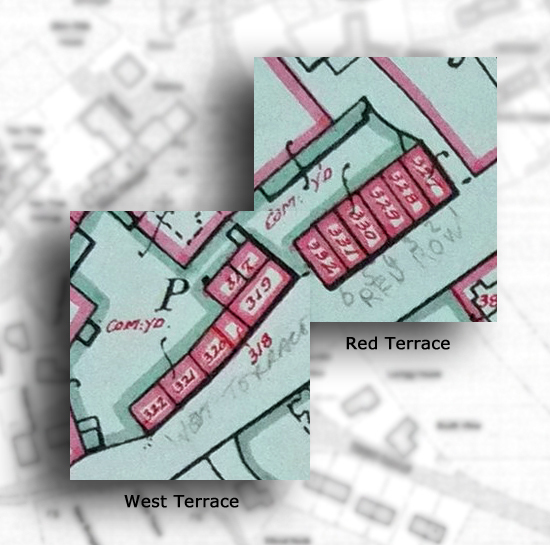 The house at the extreme right – number 3 West Terrace (319 on map above) is a back to back with numbers 1and 2 West Terrace (317 on the 1913 map above). Please state your address (house name or number and street name), who lives there and any other interesting information. Please enter current details and specify which property these pertain to. Thanks to a grant from the Heritage Lottery Fund 'All Our Stories' programme, we have been researching our village history and local stories. Your property 100 years ago! Register your email address below and we will send you updates with the latest news and events in and around the village.